What I wanted to do is improve upon Purdy’s snowballs. I don’t buy a lot of chocolate at Purdy’s but every so often, when I’m walking down South Granville or through Oakridge mall, I’ll pop in and buy a couple snowballs or coconut clusters to nibble on my walk. But I’ve been finding the dairy cream center in Purdy’s snowballs way too sweet these days. Time for an update. I liked the idea of a coconut flavored center, and thought of making a coconut-flavored fondant, but it dawned on me that using a fondant base would mean a very sweet center too similar to Purdy’s. Luckily, I stumbled upon this recipe for coconut snowballs. Finally, something closer to what I had in mind. 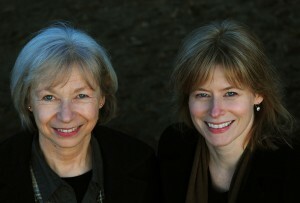 A bonus was it being gluten and grain free — practically Paleo, I’d say. Now this could definitely be a hit with the family. And so began the tweaking. What I ended up with is a creamier and slightly sweeter center than the recipe I started with, but still something that wasn’t cloying like the dairy cream inside Purdy’s snowballs. Yippee! Time for a short Snoopy happy dance around the kitchen as I package these up for small gifts for family and friends this Christmas. A note on the timing: The coconut centers take practically no time at all to whirl together in the food processor. What takes the time is portioning them out and, especially, coating them in chocolate and coconut. (I tempered my chocolate so that they would have a nice snap when you bite into them.) 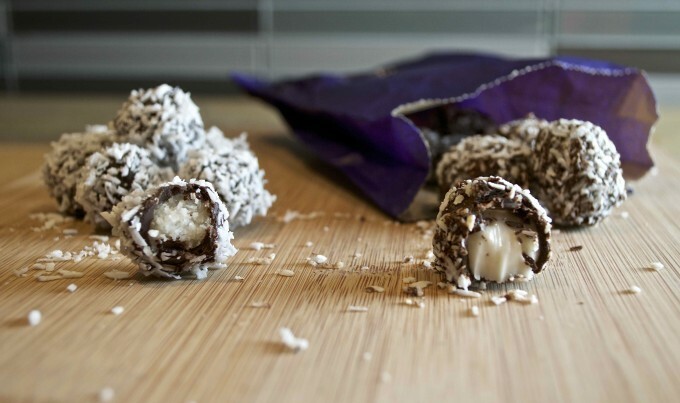 For a less labor-intensive route, simply roll the coconut centers in coconut to finish them off. But you’d miss the chocolate if you did that, wouldn’t you? In my opinion, these are a big improvement over Purdy's snowballs -- less sweet, even more 'moreish' as Bob would say. This recipe makes a lot -- 134 small (1/2 teaspoon) snowballs. Feel free to cut it in half if you're running short on time, or make the snowballs bigger if you like. 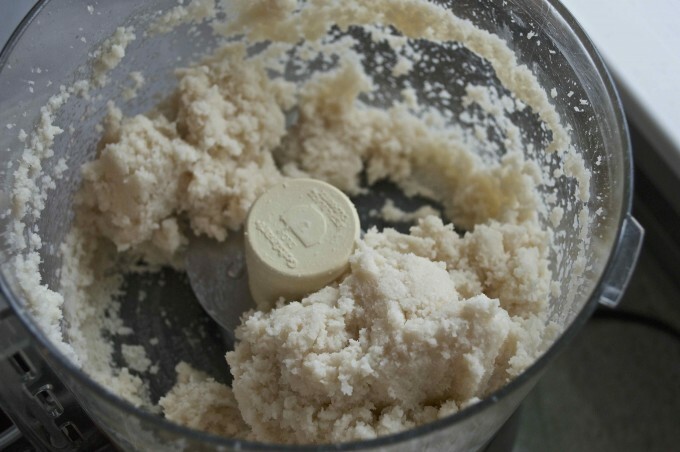 Combine all the ingredients for the filling in a food processor and mix until well combined. Scrape down the sides of the processor bowl with a spatula and process again. Portion the coconut mixture into 1/2 teaspoon measures and shape into balls with your palms. Place 2 cups coconut in a shallow bowl. Roll coconut balls in coconut and place on parchment-lined baking sheet. 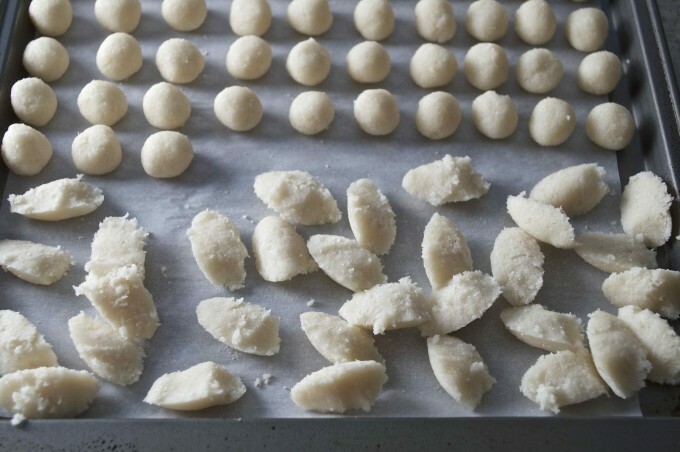 Place coconut balls on parchment-lined baking sheet and freeze for at least an hour. Melt, or preferably temper, the chocolate. 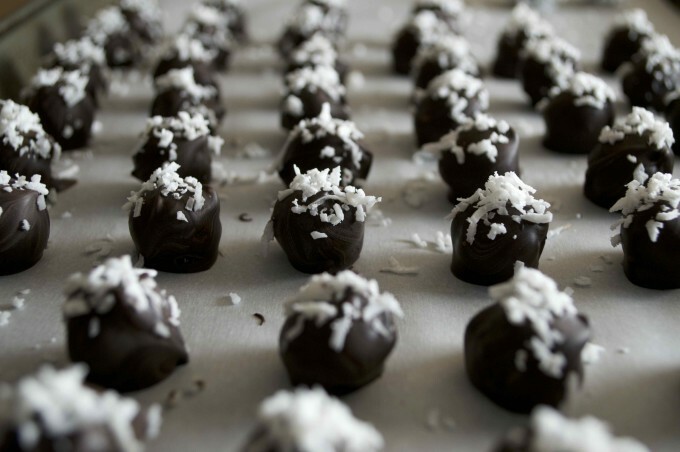 Dip each coconut ball into the chocolate, roll in coconut and place on a parchment-lined baking sheet. Or place the chocolate coated coconut ball right on the baking sheet and immediately sprinkle each with coconut. How to temper chocolate? Here's a good video that shows you the basics of tempering chocolate. What if I don't want to temper the chocolate? No problem -- just be sure to roll the snowballs in coconut after dipping in chocolate, and keep the snowballs refrigerated. I am trying to find a snowball receipe that uses potato as the centre and it is covered with chocolate and coconut. Have you such a receipe? I know exactly what you’re talking about. We used to make them sometimes when I was a kid and there were leftover boiled potatoes. I don’t have a recipe as much as a method – I remember that the first step was to mash the cooled potatoes until smooth, then add enough icing sugar to get the required texture. If the potatoes were too dry, we added a little milk to soften them. 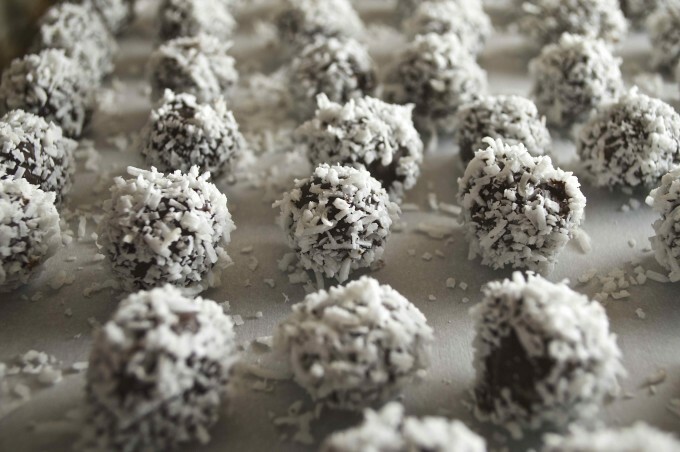 Then they were rolled into balls, dipped in chocolate and coated with coconut. I just Googled and found this recipe: http://www.tias.com/cgi-bin/newsletterArticles.cgi?na=62517 but I notice it has two cups of coconut and two cups of icing sugar to half a cup of potato. I remember something with much more potato, and the only coconut was on the outside. When I search my memory, I don’t remember Mom ever using a recipe for these – it was all a question of touch, and getting the texture the way you wanted it to be. If I were tempted to try it again, I’d start with a cup of potatoes and slowly add icing sugar, tasting as I went.